What I'd really like to say good riddance to is not the month, but to winter. Unfortunately, that may not happen for a couple of months yet - at least not fully. My skin itches until it flakes off like sawdust, which then makes up 90% of the dust in my house. Who says you can't be everywhere at once? I hate the neighbor 3 doors down for putting a layer of salt 1/2 inch thick on his sidewalk. He's salinating our rivers and lakes, (if salinating is even a word. If it's not I don't care, because its February) My poor dog and his bloody paws, hates him worse. The snowbanks have all glaciated. I have drumlins and eskers and moraines forming in my backyard (for all of you geology buffs). Yesterday I saw 3 students shovelling, yes, shovelling the Carroll University football field. Now there's a workstudy job for someone. I thought to myself, has anyone in the front offices checked their calendar? Sometimes we get snow in March in Wisconsin. Sometimes it's A LOT of snow. But yeah, lets get it cleared off in February. My furnace cycles on for 3 minutes off for 10 on for 3. Repeat to infinity. Increments get shorter as the temperature drops. Earlier in the winter, I'm pretty sure I did nerve damage to my fingers while putting air in my car tires. Now, everytime I take my gloves off for more than 30 seconds my hands hurt. Or maybe that's just normal. In any case, I not likey. My cats are absolutely nuts right now. They're obsessed with eating and have turned their noses up at anything except wet food. 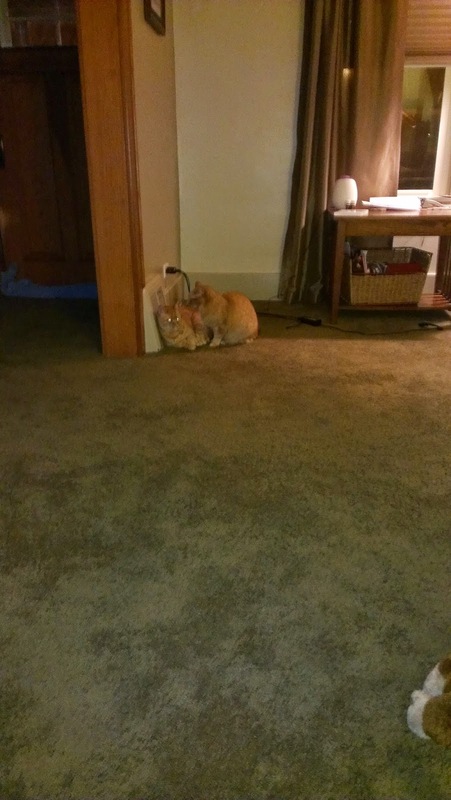 At the moment they are giving each other tongue baths in front of the heat vent. Me, I'm breathing their dander. Yum. I not likey either. 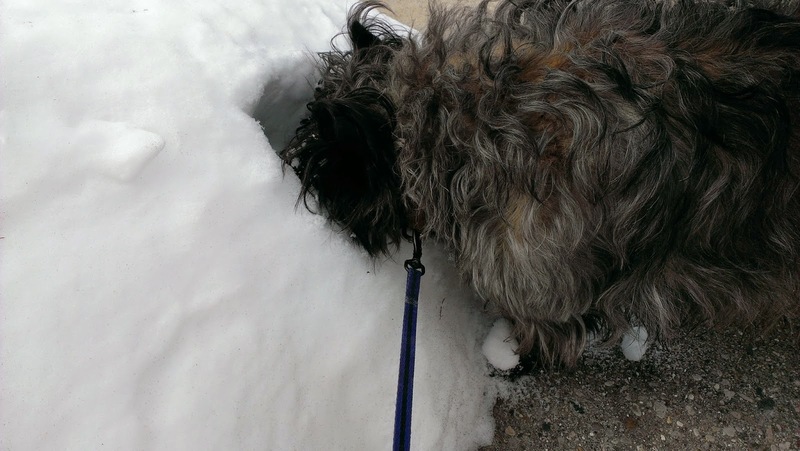 I've given up scooping Toby's poopsicles until spring. Right now they're stacking up like cordwood. Most of them are frozen to the ground and would require a pick axe anyway. I like to think of it as three dimensional dog art. I'm tired of hand lotion, rock salt, dry air, slush, ice, slushy-ice, icy-slush, Christmas lights (seriously? ), hot cocoa, darkness, and the sound of road plows. I'm tired of all of it. So good riddance February. And while your at it, take your flirty friend March with you. I felt bad laughing while reading this, since I can tell you really mean it, but what a hilarious post! "Who says you can't be everywhere at once?" Great!